Continuing on to Day Four of my Seven 7×7 Restaurants in Seven Days series! 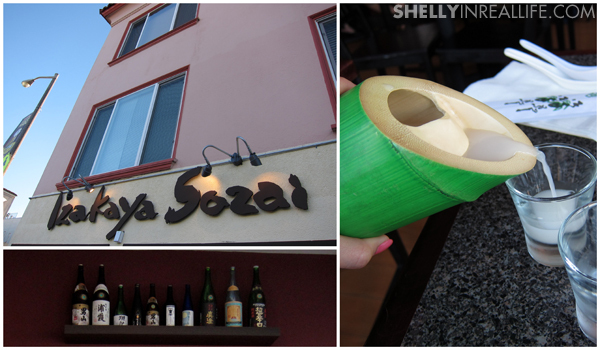 Izakaya Sozai is one of two ramen places listed on the 7x7 list. Comparing the wait time on the two, Izakaya, located in the Inner Sunset, is definitely more accessible in terms of wait time. Katana-ya is in Union Square and is considerably smaller than Izakaya. I headed over to Izakaya with a friend at around 6 PM for an early dinner on a weeknight and the small restaurant was only half full. No wait? Sounds good to me! Izakaya's menu featured a large variety of Japanese staples such as yakitori, sashimi, and of course, sake, along with their coveted 7x7 menu item, the Tonkotsu Ramen. 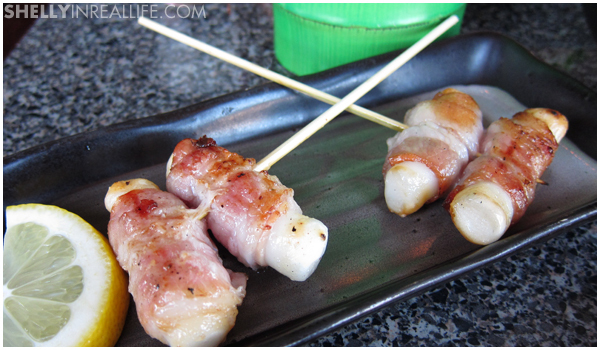 First, we had their Bacon Wrapped Mochi which was delicious. Come to think of it, bacon wrapped anything is delicious, but especially this. Silly me, when I first heard the words "bacon wrapped mochi", I thought it was going to be a dessert mochi, but as it turns out, the mochi was rice cake. Anyway, this was delicious. Order it. Sometimes I feel really disgusting for saying this, but I LOVE chicken cartilage. I love gnawing on the bone of my chicken thigh to eat the yummy yellow tendon/cartilage. 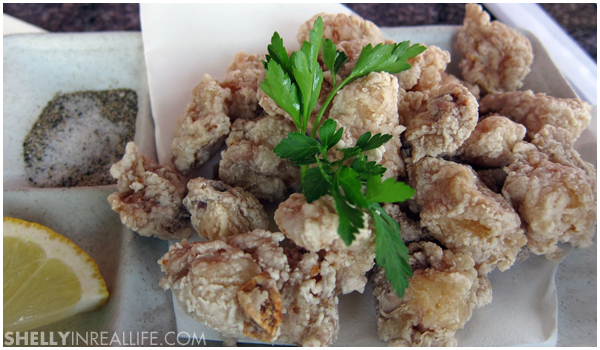 So imagine my joy when I first discovered Fried Chicken Cartilage during my semester abroad in Hong Kong. 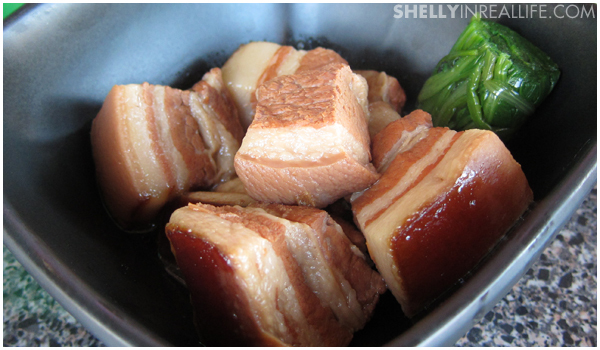 In Hong Kong, this amazing dish is usually served with porridge and beer. Nom nom nom! This was the first time I've seen Fried Chicken Cartilage in America, but sadly, I wasn't satisfied. I thought there was too much of the bony cartilage here. Perhaps I've just been primed with how this dish is supposed to be based on my HK standards, but my eating partner in crime wasn't a huge fan either. We ended up only finishing less than half of the dish, so I definitely wouldn't order it again. Their pork belly was pretty tender, but I wouldn't classify it as "melt in your mouth" tender. This dish actually reminds me more of something that I would have at a Chinese restaurant, except it was served with its watery braising liquids, hot mustard and some spinach on the side. Izakaya's ramen is over-hyped. 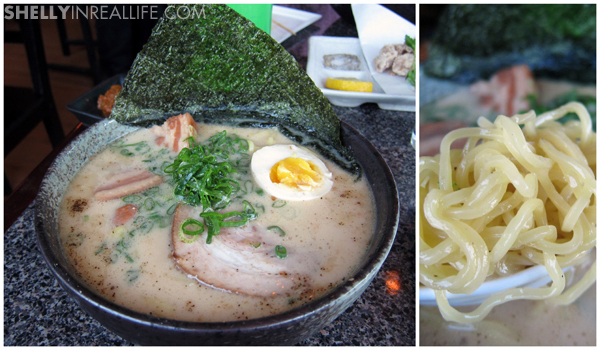 They are known for their broth but despite its creaminess, it was still lacking in flavor; savory, but not flavorful. The chashu was also mediocre. I like my chashu to feel like it's been cooking for hours and hours so it just melts as you eat. However, this was a bit chewy, almost tough. The noodles were cooked al dente, and had the texture that I enjoy, but that shouldn't be the most exciting part of the bowl! I love Japanese tempura, fried at the perfect temperature and with the right type of oil, fried foods can feel light and not greasy. 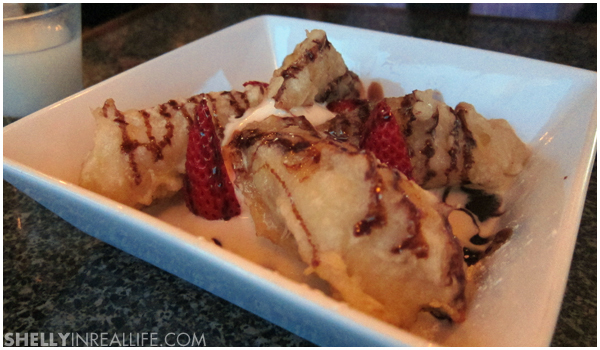 That's how this banana dessert was fried and I was a happy camper. Shelly's Verdict: This is the fourth 7x7 restaurant (technically fifth since Day 1 featured 2 different spots), and a pattern seems to be emerging... the favorite item of the restaurant seems overrated, but a select few dishes might be worth trying. I wouldn't die if I didn't have this ramen, but if you're in the neighborhood, Izakaya Sozai would be a nice stop for dinner. Caveat: early dinners only, because by 8 PM, there were definitely tons of people waiting for a table.